*Please note that NFD games kick off time has changed from 15:00 to 15:30. After losing 1-0 to Cape Umoya United and in the process suffering their first defeat of the season, Mbombela United are now three points off the pace and lie in ninth place. That has taken their winless streak to three games. Richards Bay have just one more point than their hosts and lie in sixth place. Sandile Mthethwa buried Paseka Sekese’s pass to hand them a 1-0 victory over Ajax Cape Town on Sunday. They will be hoping to avoid being leapfrogged by their opponents on the table. I’m expecting the visitors to go to Mpumalanga Province and defend, causing the match to end in draw. University of Pretoria played out to a goalless draw against Maccabi this past weekend and that was their third draw in six games. They host the only side that is yet to lose this season, in the shape of table-topping Tshakhuma Tsha Madzivhandila. The Limpopo-based outfit have won three and drawn three of their six games so far this season. The form book leans towards Tshakhuma and I’m backing them to win. Real Kings are one of the two teams that are still winless this season and are currently rooted to the foot of the table. Having drawn one and lost five of their opening six matches, the Magic Boys welcome Royal Eagles who are high on confidence after beating second-placed Uthongathi 1-0 in last week’s KZN derby. Eagles are unbeaten in the last four games with two draws and two back-to-back wins. It makes sense to put your money on the visitors. This promises to be a mouth-watering clash between second-placed Uthongathi and third-placed TS Sporting. The Cane Cutters suffered their first defeat of the campaign last week when they lost the KZN derby 1-0 to Real Kings. 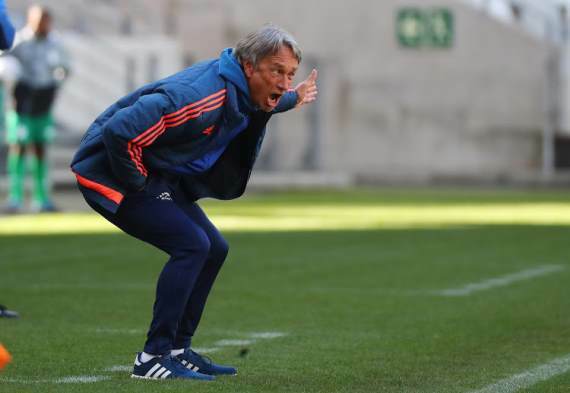 TS Sporting are undefeated since gameweek one and coach Benson Mhlongo was back in the dugout last week when they beat struggling Ubuntu Cape Town 1-0. Going into the game, both sides are tied on 11 points and none of them want to lose ground on other pace setters, hence a cagey affair must be expected. Put your money on a draw. Witbank Spurs, who are winless since week one, lost 2-0 to TS Galaxy in the Mpumalanga derby last week. They head into this particular encounter off the back of four consecutive defeats which followed a draw. This will be a stern task against Stellenbosch who are looking to break into the top three. The Stellies are unbeaten since moving to Idas Valley in the Cape Winelands, where they have won two and drawn one of their three matches there. This will be their first away game ever since. Dangerman, Iqraam Rayners, bagged a brace in their 2-0 victory over Real Kings last week. Back the visitors collecting maximum points against a struggling side. Jomo Cosmos held top-placed Tshakhuma to a goalless draw last week. Goalkeeper, Mwenya Chibwe, was probably his team’s best player on the day, making several outstanding saves to deny the sharpshooting TTM forwards led by former Kaizer Chiefs striker, Edward Manqele. Chibwe has kept four clean sheets in six games. On the other hand, Letsie Koapeng pounced on Nathan Paulse’s assist to hand his team maximum points against Mbombela United. Both sides are on nine points and I see neither of them having the upper hand. A share of the spoils is a likely result. TS Galaxy secured their first win since promotion to the NFD after defeating Witbank Spurs 2-0 at Kameelrivier Stadium on Sunday afternoon, thanks to goals from Nyembezi Setelele and Sakhele Nhlabathi. The team played attacking football which Dan Malesela is known for and they seem to have adapted to his tactics. Ajax Cape Town, who are among the PSL promotion favourites, lost 1-0 at Richards Bay last week and they’ve fallen out of the top four. This is a tough one to call hence why I’ll keep it safe and back the hosts to win or draw. Ubuntu lost 1-0 to TS Sporting despite having the ball in the back of the net. The indirect free kick scored by Devon Saal was deemed by the referee to not have moved after the ball was touched onto him. The struggling Capetonians are second from the bottom on the log and they will be looking to get out of the relegation zone as soon as possible. Maccabi were involved in a 0-0 draw with University of Pretoria last week, taking their draw tally to three games in six outings. I foresee them recording another stalemate way from home against a side that I don’t expect to beat anybody anytime soon. Back a stalemate.